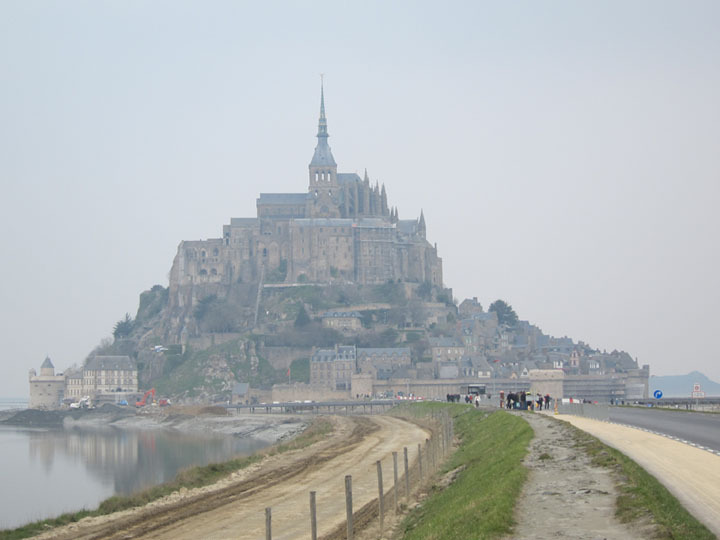 Mont Saint-Michel has always seemed liked a mystic place. Totally isolated, the massive religious fortress seems to rise from the sea. Settled by a hermit saint in 8th century on a tidal rock, kings and commoners alike have sought out this place continually ever since. 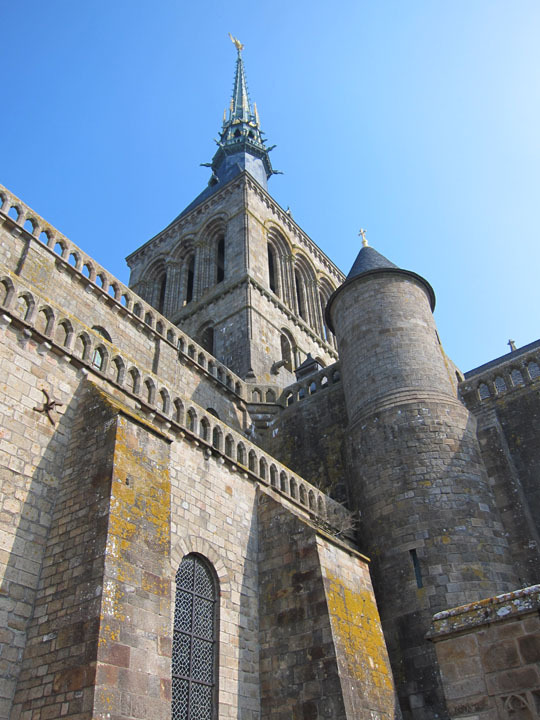 One of the most recognizable places in France and a UNESCO World Heritage site, you better believe I was going to spend some time exploring Mont Saint-Michel! 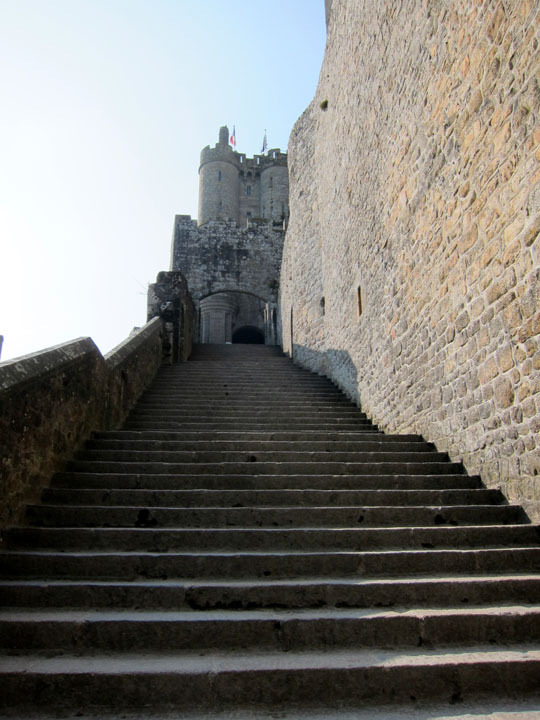 So in the spirit of those medieval travelers who made the pilgrimage to the Romanesque Church of the Abbey crowning the mountain, here’s how I approached and climbed Mont Saint-Michel. Even in the off-season (March), bus loads of day-trippers arrive from Paris mid-day completely overrunning the small lower town and historic site. And so, we arrived early. By 9am, the last of the morning fog had just burned off and the sky was totally clear. 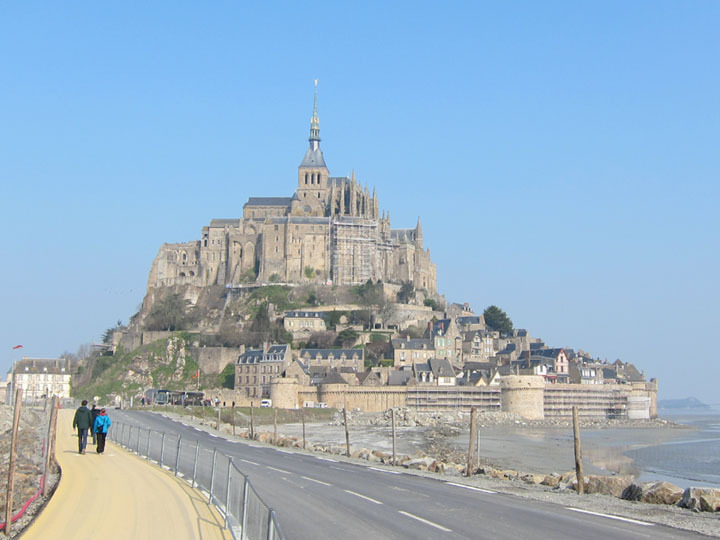 There is a temporary road with shuttle service from the mainland to Mont Saint-Michel. This road will eventually be replaced with a sleek, modern peninsula currently under construction. 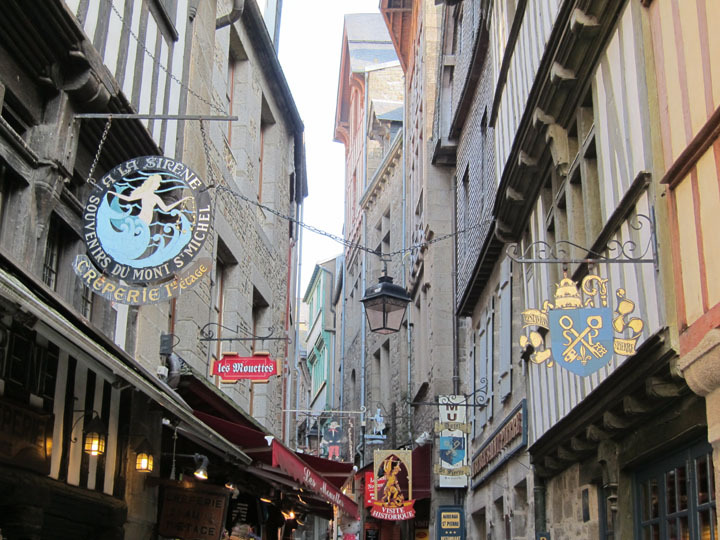 Upon entering the city walls, there is steep winding street of shops, restaurants and a few hotels. I marched diligently through but definitely appreciated the design of the signs. Once through the city, the walled Abbey came into view. The view from the top level was amazing. 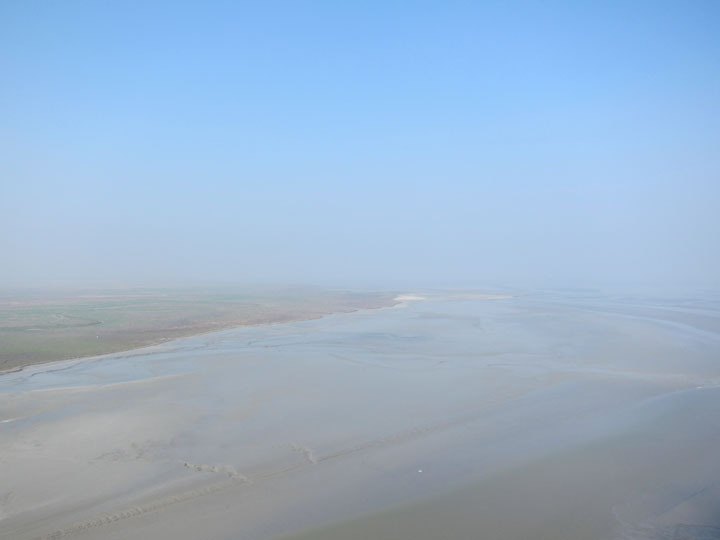 The haziness blurred the horizon line and mixed the sandy flats into the sky. 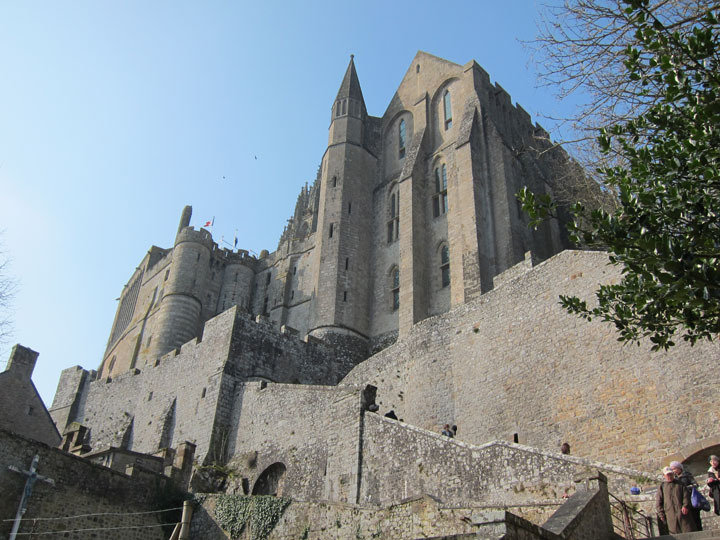 After spending hours exploring the abbey, church and inner rooms, I walked around the outer ramparts. Clouds at rolled in. (I did mention that I spend hours inside right?) 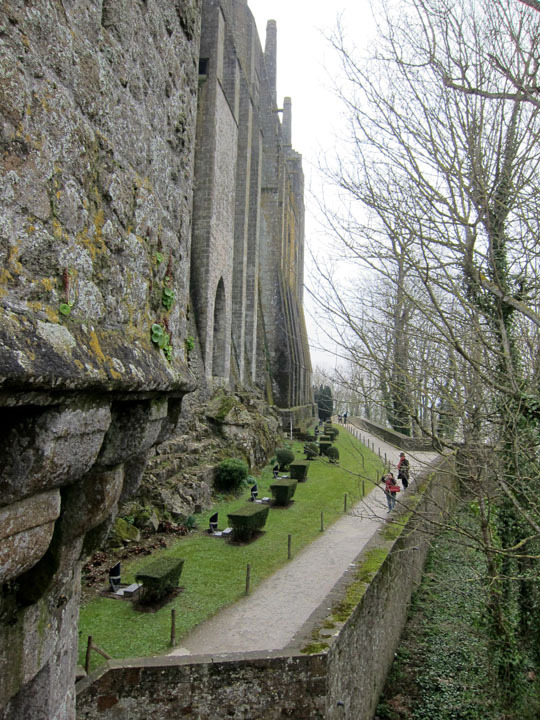 The thick stone walls were like sheer, man-made cliffs. 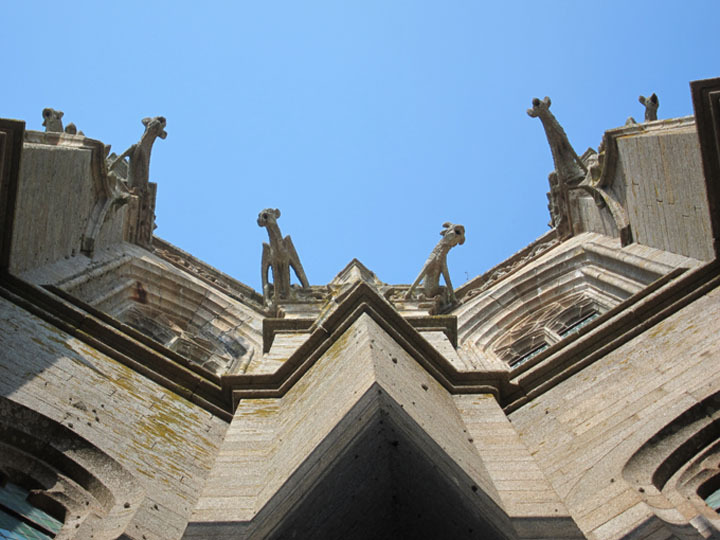 From this vantage point, you definitely get a new perspective on the massive scale of Mont Saint-Michel. 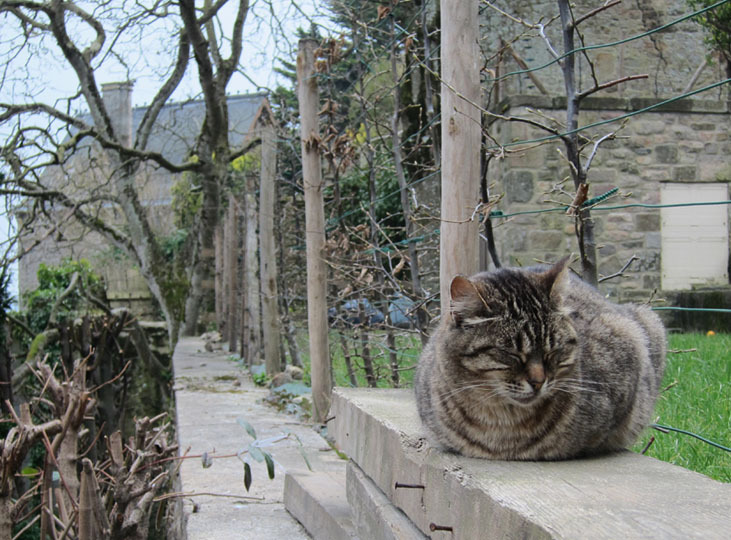 Of course, I can never resist the lazy cats that seem to live in all the great ruins and churchyards of Europe. The overcast skies made for a dramatic departure after a wonderful day. 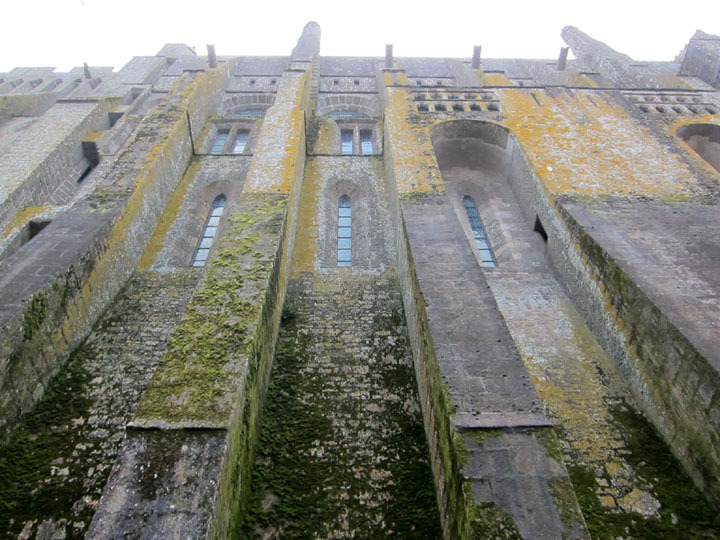 Of course Mont Saint-Michel is more than just its imposing exteriors. Founded by those seeking spiritual enrichment, you can imagine that the high, thick walls were meant to protect hose pursuing higher endeavors inside. In another post, I walk you through the sacred and tranquil interior spaces. Absolutely gorgeous! I have always wanted to go there. Definitely want to visit someday 🙂 Great photos! That’s hilarious that you recognize this cat! 🙂 Looks like she has a good life – attention from tourists and free range over the grounds. Definitely not a bad place to call home!